The initiate upon this Cross no longer identifies with form or even with soul, but with the will of Divinity and with the eternal plan and purpose. The Cardinal Cross is a fusion of the Life, Soul and personality. The four energies of this Cross govern and direct the soul as it moves forward upon the Path of Initiation. It deals with so exalted a state of consciousness that little can be said about it except the vaguest generalities. This Cross of Initiation is "the beginning of the endless Way of Revelation" which starts when Nirvana is entered. The human transcends nature and is in at-one-ment with all Enlightened Ones. Those who lie upon this Cross know and enjoy the significance underlying the words: Omnipresence, Omniscience and Omnipotence. The four energies of this Cross are tinctured with the Light of the seven solar systems of which our solar system is one. The scope and cycle of the influence of this Cross in the life of the initiate is utterly unknown even to our planetary Logos Who is stretched upon its widespread arms. 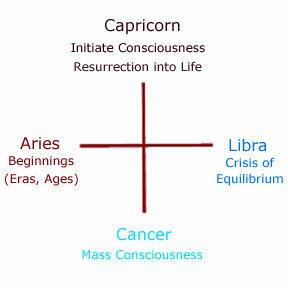 When we are talking about the crosses, are we talking about Aries the sign or Aries the constellation? They are interchangeable. The constellation empowers the sign.